David Fuller, a member of the Kankakee Area StarGazers in Illinois, has been producing some pretty great content about observing the sky from urban and suburban locations for several years now. His main purpose is to draw attention to light pollution and to inspire those who have never seen the sky to look toward the heavens. An astronomy enthusiast for more than 30 years, David has written many local newspaper articles about astronomy and for the past couple years has turned his attention to producing videos. 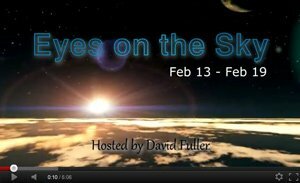 I encourage you to check out some of David’s videos, which are posted on his website, www.eyesonthesky.com, and on YouTube. David produces a weekly sky observing video with highlights of what can be seen that week, and has made quite a few videos detailing how to use scopes and other equipment. The astronomy field needs more energetic promoters like David. Congratulations to him, and I urge the rest of you to give him your support.